Sorry. At the moment this section is not available due to improvements to our site, please try later. We want to share with you our most relevant news and press releases. Here you will find everything you need to learn about our company and everything we represent. 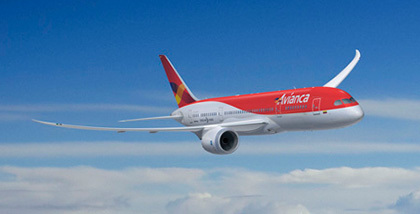 Panama City, Nov. 15, 2012 – Boeing (NYSE: BA) and Avianca Airlines, Colombia's flagship airline, today announced an order for three 787 Dreamliners. The order was previously attributed to an unidentified customer on Boeing's Orders & Deliveries website and is valued at approximately $620 million at published list prices. Today's order brings Avianca's total 787 order count to 15 Dreamliners, which includes the 12 787s ordered in 2007. The total order value stands at more than $3.1 billion. "Adding more 787s to our order aligns well with our expansion and service improvement plans for the airline," said Fabio Villegas, CEO of Avianca Airlines. "The range and efficiency of the airplane make it a great fit into our overall fleet plans and interior of the airplane will bring a unique flying experience to our passengers that only Avianca can provide." "Avianca is one of the region's leading airlines and we are happy we can play such a pivotal part of their future growth plans," said Van Rex Gallard, vice president of Sales for Latin America, Caribbean, & Africa, Boeing Commercial Airplanes. "The Latin American market continues to show signs of growth and prosperity. The 787's unmatched operating economics and passenger appeal will help Avianca continue to position itself as a preferred airline and grow its market share in the region." Made primarily from composite materials, the Boeing 787 Dreamliner is the first mid-size airplane capable of flying long-range routes. As a result of innovative technologies, the airplane offers unparalleled operating economics, fuel efficiency and passenger comfort. The 787 Dreamliner has received more than 800 orders from 58 customers since the launch of the program. Avianca is part of AviancaTaca Holding. With a modern fleet of more than 140 short, medium and long-haul aircraft and a team of more than 17,000 employees, Avianca and Taca directly service more than 100 destinations in the Americas and Europe, which connect to more than 750 destinations in the world through interline and codeshare agreements with partner airlines around the world. With more than four million members in its loyalty program, the airline group reports combined annual sales of more than three billion dollars. Its multi-hub operating model offers passengers convenient and varied flight options, through Bogota, Colombia; San Salvador, El Salvador; Lima, Peru and San Jose, Costa Rica. 2013 Avianca Cargo™. All Rights Reserved.